How big was Brachiosaurus altithorax? I mean, really? I’m currently writing a popular guide to dinosaurs, to be published by Random House next autumn [Ed. : available now at amazon.com and at amazon.co.uk]. I’ve been writing about [Brachiosaurus and Giraffatitan], and have read your 2009 study vindicating the proposal to separate them into two genera. I know you consider Brachiosaurus likely to have been bigger (and note that the specimen was not fully grown), with a longer trunk and tail – but most of the sources I can find give both animals the same body length, generally around 26m. Presumably this doesn’t reflect your work, and your calculations are different. I replied at the time, and said that I’d post that response here on SV-POW!. But one thing and another prevented me from getting around to it, and I forgot all about it until recently. Since we’re currently in a sequence of Brachiosaurus-themed posts [part 1, part 2, part 3, part 4, part 5, part 6], this seems like a good time to fix that. So here is my response, fresh from November 2011, lightly edited. Well, Giraffatitan has only been recognised as a separate animal at all in the last couple of years, and nearly everything that has been written about “Brachiosaurus“, at least in the technical literature, is actually about Giraffatitan. So existing sources that give the same length for both are probably not making a meaningful distinction between the two animals. First, on Giraffatitan: Janensch (1950b:102) did a great job of measuring his composite mounted skeleton. His figure for the total length of Giraffatitan along the neural canal is 22.46 m, and is certainly the best estimate in the literature for an actual brachiosaur specimen (and quite possibly the best for any sauropod). I don’t know where the figure of 26 m comes from, but as Janensch (1961:213) notes, the isolated fibula XV2 of Giraffatitan in the Berlin collection is 134 cm long, compared with 119 cm for that of the mounted skeleton. This is 1.126 times as long, which if scaled isometrically would yield a total length of 25.29 m. So that is defensible, but 26 m is not, really. I would advise sticking with Janensch’s published figure of 22.46 m, as it’s based on good material, and also because it forms the basis of my comparative estimate for a Brachiosaurus of similar limb length. Now in my 2009 paper I estimated with reasonable rigour that the torso of Brachiosaurus was probably about 23% longer than that of Giraffatitan, yielding 4.82 m rather than 3.92 that Janensch gave for Giraffatitan. On much less solid evidence, I tentatively estimated that the tail of Brachiosaurus might have been 20-25% longer than that of Giraffatitan. Given the paucity of evidence I would play safer by going with the lower end of that estimate, which would give a tail length of 9.14 m compared with Janensch’s 7.62 for Giraffatitan. Riggs (1904) tells us that the sacrum of Brachiosaurus is 0.95 m long, which is slightly less than 1.07 m for Giraffatitan. Finally, since we know nothing of the head and neck of Brachiosaurus, the null hypothesis has to be that they were similar in proportion to those of Giraffatitan. Putting it all together, Brachiosaurus may have been longer in the torso by 0.9 m, and in the tail by 1.52 m, but shorter in the sacrum by 0.12 m — for a total additional length of 2.3 m. That would make Brachiosaurus 24.76 m long, which is 10% longer than Giraffatitan. Note that all the Brachiosaurus figures are given with much greater precision than the sparse data we have really allows. I think you could round Janensch’s 22.46 m for Giraffatitan to 22.5 and be pretty confident in that number, but you shouldn’t really say anything more precise than “maybe about 25 m” for Brachiosaurus. Finally, you correctly note that the Brachiosaurus specimen was not fully grown — we can tell because its coracoid was not fused to the scapula. But the same is true of the mounted Giraffatitan, so these two very similarly sized animals were both subadult. How much bigger did they get? We know from the fibula that Giraffatitan got at least 12-13% bigger than the well-known specimen, and I’d be pretty happy guessing the same about Brachiosaurus. And I wouldn’t rule out much bigger specimens, either. Could it be that the 26 m estimate is taking into account the subadult status of the specimens? If scaled even modestly for an extra 10% to reach adult size, that easily puts the length at around 26 m, even going near 28 m according to your figures (past 28 m if using your 12-13% increase). If it is, then 26 m is a fairly conservative estimate. Yes, I guess something like that might be going on. But, really, who knows where these numbers come from? For many years I “knew” that Diplodocus carnegii CM 84 was 27 m long. Then I read Hatcher (1901:39) and found that it’s only 68 feet = 20.7 m. That’s not a trivial difference — the “well-known” figure of 27 m is 30% longer than the true length. So where did it come from? Was it just a transcription error from the 20.7 m of Hatcher? Possibly not,as he gives no metric measurement. Did it get scribbled hurriedly down in the manuscript of a kids’ book, then religiously copied into subsequent books? By the way, this means that one of the things everyone “knows” about sauropods — that Diplodocus was longer but lighter than “Brachiosaurus” (= Giraffatitan) is wrong. At 22.46 m, Janensch’s beast is 1.76 m longer than Hatcher’s; and Riggs’s would have been even longer. How long is the USNM Diplodocus? It’s exciting that lack of fusion of appendicular elements supports a ‘subadult’ age for both of them. I’m aware that Wilhite (2005 in Thunder-lizards) on Camarasaurus, Schwarz et al. (2007) on a juvy diplodocid/now brachiosaurid, and Martin (1994) on hatchlings of Phuwiangosaurus each mention that bisection of the scapulocoracoid articulation by the coracoid foramen is a juvenile feature. Are there other references that mention this or identify this feature in other sauropods? Gilmore 1932 says the USNM Diplodocus is 70 ft 2 in/21.4 m, but I believe he also says it’s shorter than the Carnegie mount. I don’t know of other references on this; in fact I wouldn’t have been able to reel off the ones you just mentioned. What’s more interesting still — we touched on this in our neural-spine bifurcation paper but haven’t really given it the emphasis it deserves — is that various different indications of skeletal maturity indicate that very few of the well-known sauropod specimens are fully mature. NOTE TO SELF (and to Matt): must blog about this. Ah yes, of course — the Gilmore paper is the one to look at. Thanks for that. Gilmore’s Plate 6 shows the mounted skeletons of both the Carnegie and USNM specimens — presumably to the same scale, though the caption only says “both are about 1/20 natural size”. The USNM specimen is longer. The National Museum skeleton as restored has a greatest length between perpendiculars of 70 feet 2 inches, and in front of the hips the tops of the spinous processes of the vertebrae are 12 feet 5 inches above the ground. The head in the post adopted is 14 feet 6 inches high, but it is clearly apparent that in life it could have been elevated still higher. The skeleton of D. carnegii is said to be [my emphasis] 84+1/2 feet in length (probably measured over the curve of the backbone) and 14+1/2 feet high at the hips. I am at a loss to explain the difference in height between the two skeletons, especially since the individual limb bones of the two specimens have practically the same linear dimensions. The difference in length may be accounted for by the slightly greater length of the individual vertebrae of D. carnegii and by the omission in the present skeleton of four caudal vertebrae as mentioned elsewhere. I wish Gilmore had given a reference for that 84+1/2-foot measurement of the Carnegie specimen, which is nearly a full quarter longer than reported by Hatcher. It’s equivalent to 25.75 m, which is still not as long as the widely quoted 27 m.
Strange, too, that the Carnegie specimen, with limbs the same length as those of the USNM specimen, should be as much as 20% longer. Even allow for four missing caudals, that’s a lot of additional length in the individual vertebrae. Maybe this is a legitimate species distinction? Mike, I’m pretty sure that most of the (admittedly awful) dinosaur books that I had as a kid gave an amazingly accurate 87½ feet as the length for Diplodocus (specimen and/or species not specified). This is 27m, rounded to the nearest metre but I can’t help with where this figure might have originated (I had assumed that it was the length of the Carnegie-sponsored mount, although measured “along the curve” to give a more impressive length). For reference, IIRC, “Brontosaurus” was given as 78 ft, Brachiosaurus (Giraffatitan?) as 74 ft, and a certain over-exposed theropod as 43 ft. I think a source of discrepancy regarding the length of CM 84 is how many caudals Hatcher (1901) thought there were, between 35 and 40 according to page 37, looking at modern skeletals like that of Scott Hartman, counting up to 40 caudals excludes all of the “whip” and a bit more, about 5m. Mark, strange that your book is spot on with regards to “Brachiosaurus” (= Giraffatitan): Janensch’s 22.46 meters is 73 feet, eight inches, so the four-inch discrepancy is noise. 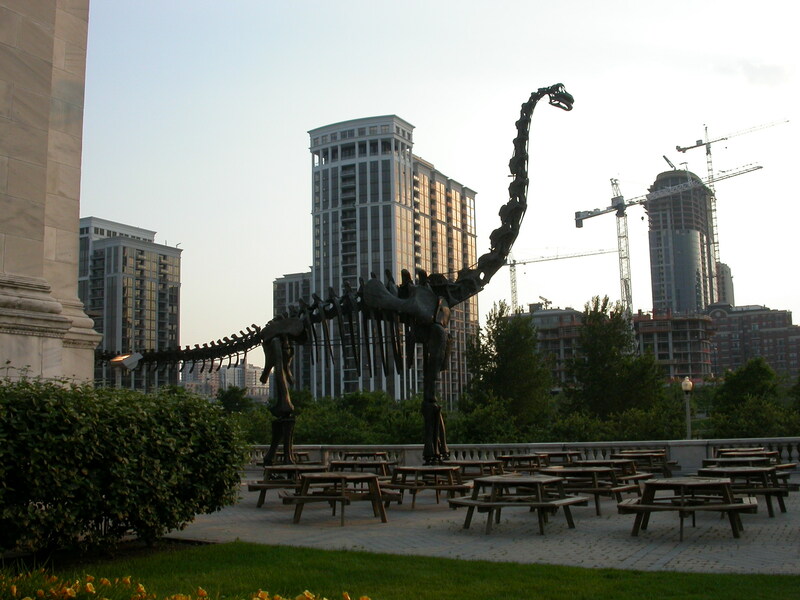 Yet it has the standard inflated Diplodocus length, and an unsupportable 23.75 m for Apatosaurus. I can only ascribe this to Chinese Whispers. MBR, you’re no doubt right that the extra length of the Carnegie Diplodocus is due to missing whiplash caudals. Yet Hatcher’s (1901) Plate XIII still shows a pretty long tail. It’s hard to believe that they legitimately added a whole nother quarter to its length. Strange. This mystery might have to be promoted to its own post.